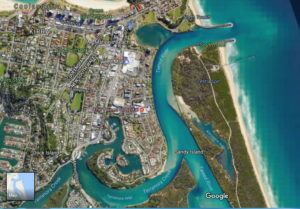 The Tweed River provides some cost effective and very satisfying diving. The mouth of the river is, as might be expected, tidal. Hence diving needs to be organised around the tide tables. All Tweed River dives are done on the incoming tide. Once the tide turns, the visibility rapidly diminishes and there is an additional danger of being swept out over the bar. Remember that when there is a large body of water, the slack water does not coincide with high tide. Slack water will be anything from 30 minutes to over an hour behind the high tide time. The larger the tide difference, the longer the period between high tide and slack water, and, the shorter the period of slack water. The Tweed River has a variety of fish life. At various times of the year the life changes. During the year, a diver can expect to see Octopus, Rays, Dolphins, all sorts of smaller fish as well as large cat fish, flathead, turtles, cod and whiting. During slack water, the river makes a safe training area and practice area for divers. We no longer train divers. There is an advanced drift dive available for experienced divers only. Here we enter the water near the river mouth (at the sandy beach) and drift up to, and past, the Tweed Hospital. Come and enjoy the shore dives. Unfortunately, with rising costs, AllWays Diving has had to implement a small administration charge to cover the cost of transporting equipment etc to the dive site. Contact us for details. At various times, AllWays Diving offers a BBQ with the shore dive. Again check the calendar (on the side of the page) or contact us for dates and times.